Christmas Snack Platter - Dessert Board for Kids and Adults! Home » Christmas Snack Platter – Ultimate Dessert Board for Kids and Adults! 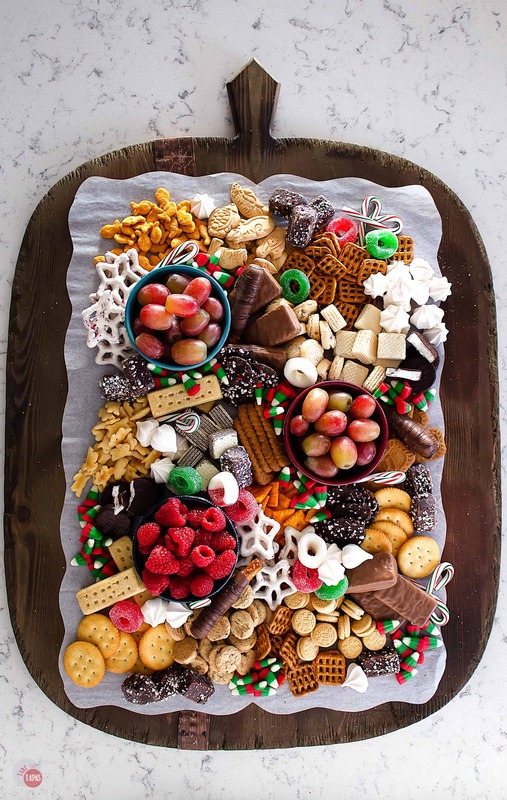 When you are neck deep in holiday stress and need a tray of sweets for a party or to satisfy the kids while you wrap some gifts, check out this ultimate Christmas Snack Platter! Full of sweets, cookies, and fruit to keep all hands busy. Holiday parties are fun but can be totally exhausting if you are hosting them. Also, tiring AND filling if you are the guest to one or multiple parties over the course of the season. Your pants start feeling tight and you get worn down from all the excitement and eating. I have a solution for you, a snack platter! I love snacking and grazing because it keeps me from feeling like I need to eat everything on my plate at a meal, or feeling guilty at a dinner party where a plate is already fixed for me and I am either too full to eat it all or I don’t particularly like one of the foods on it. This is where snack platters, cheese boards, charcuterie plates, this Christmas Snack Platter, and veggie trays come in handy. You can pick and choose what you want to eat and how much of it to consume. Plus putting one together makes for easy holiday treats without all the stress! Just take me to the Christmas Snack Platter Recipe Already! If you’d rather skip my (very helpful, I think) tips and tricks, essential cooking info, and similar recipe ideas – and get straight to this delicious easy Christmas Snack Platter recipe – simply scroll to the bottom of the page where you can find the printable recipe card. All Christmas Platters are Not the Same! You can serve all the traditional buffet foods and make the usual snack platter, but what about dessert? When I think of the holidays I think cookie exchange! And all those delicious cookies, cakes, tarts, and candies to bake, take, and share are great but who has time to make all those AND host a party. But do you really want to serve boring trays of the same cookies? What about when you are trying to check off your holiday to-do list or wrap gifts and the kids are running wild and asking for snacks every 5 minutes? This is when I think of snack plate ideas and cute Christmas treats that I can serve them at home, at their school party, or bag up as edible gifts for friends and family. Not a bad idea for a last minute stocking stuffer either! Christmas Snacks are not just sweets! We are already over-indulging during the holidays, and we certainly don’t want to ramp up the kids with a lot of sugar, so my Christmas Snack Platter isn’t just full of candy and cookies. I have included some savory crackers and fruit too! These additions make great snacks for kids. I have included some of my kid’s favorites along with some of mine. Who knows, maybe they will start liking them too! Some of my favorite additions to the platter are from my local Sprouts market. They have sugar wafer cookies in bite-sized portions, mini chocolate chip cookies, and meringue kisses. I also found some cute Christmas desserts and candies there at this time of year. Red and green candy corn, gummy rings, and peppermint chocolate covered marshmallows. Feel free to incorporate your favorites and any other festive treats you might find while doing your regular shopping! Q: Do I have to use all store-bought items? A: No, feel free to use what you have on hand or are making for the occasion. I used a lot of premade things to save time. Q: Can I incorporate cheese and meats? A: Feel free to add what you like, but since those have storage restrictions like keeping them cool I tried to keep those off. Q: What if I am gluten-free? A: While shopping for my snack platter, I noticed quite a few gluten-free and allergy-friendly options at my local grocer. Also, check out some local health food stores or healthy markets for other options. Looking for other ideas for food trays? Other great Christmas Platter recipes to try! If you love this Christmas Snack Platter Recipe as much as I do, please write a five-star review in the comment section below (or on Pinterest with the “tried it” button – you can now add pictures into reviews, too! ), and be sure to help me share on facebook! 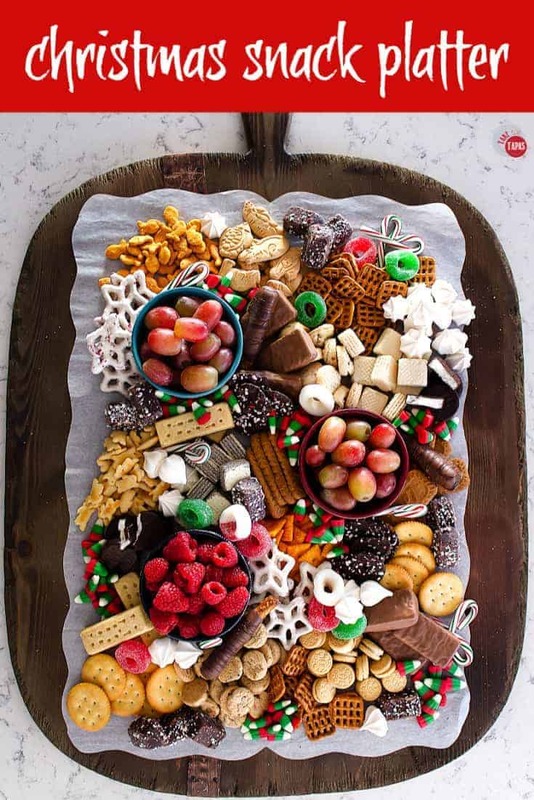 This ultimate Christmas Snack Platter is full of sweets, cookies, and fruit to keep hands of all ages busy while you wrap up some holiday tasks. Arrange all items on a beautiful tray and serve! « How to Make the Easiest Crudités Platter Ever!